Advocate to increase play & community space and oppose the privatization of Union Square Park"s pavilion! (Union Sq. Park - October 23, 2008) 10th year anniversary celebration of the dedication of Union Square as a National Historic Landmark. From left: Carol Greitzer, Eadie Shanker. Back: Founding USCC board members Margie Berk and Phyllis Andrews. 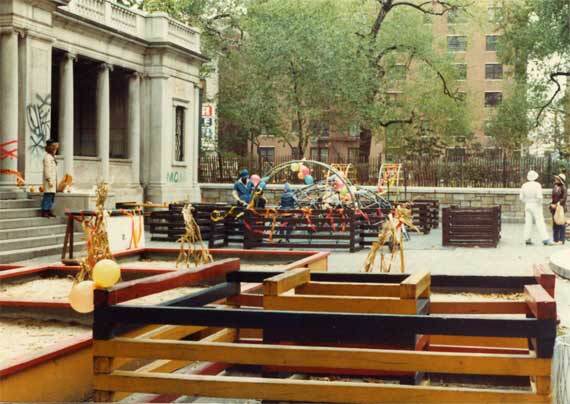 Playground equipment in the sunken terrace, circa 1985. Click image to enlarge. The BID and the City have tried to claim this area as new playground space where in fact they are restoring what was taken away by the seasonal cafe. Due its configuration and size the north end of the park has historically accommodated large gatherings of people for many reasons including protests, demonstrations and rallies. Their plan is also expected to impede on the parks' historic first amendment and free space role in the Northern Plaza as the City will be less inclined to issue permits for large gatherings in order to protect the commercial interests of the restaurant. It is this important role that served as one of the main reasons why the park was designated a National Historic Landmark in 1997. The plan is being paid for by an anonymous donor and designed by Michael Van Valkenburgh Associates (MVVA). However, unlike Manhattan's other pavilion in Columbus Park, which was handsomely restored and given back to the neighborhood for community activities (click to see more), the anonymous donor and a BID are being allowed to dictate public land use policies. They have spent millions of dollars attempting to take away and privatize much needed public space from the community. playground, mid-1980s.Click image to enlarge. In 2002, City Council Member Margarita Lopez allocated a total of $ 1.9 million over two years to renovate and expand desperately needed new playground space. For years however, the BID held up the building of a playground while they tried to push though their ill-fated plan to build a year-round restaurant. 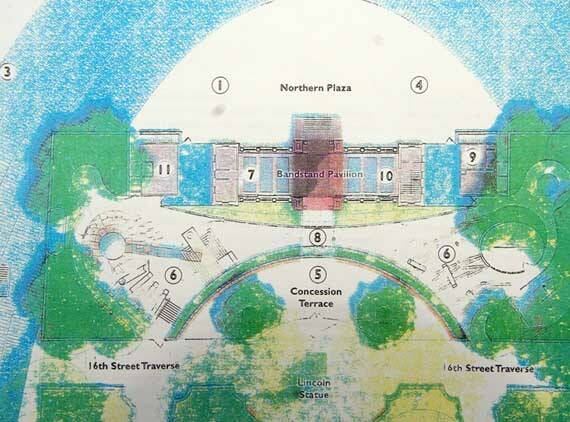 Despite the lack of playspace for children in the area, the architect's original plan increased playspace in the park by just 14% in the Pavilion. The plan included two large outdoor concession terraces to accommodate restaurant dining. One, a semi-circular terrace north of President Lincoln's statue and a second one, (illustrated below ) was adjacent to the pavilion. The plan also included building a bridge over the playground to bring restaurant patrons to the pavilion. 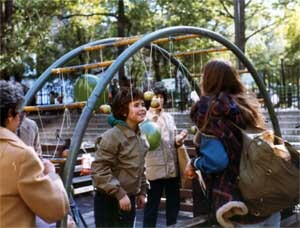 Instead of unifying the existing playgrounds east and west of the pavilion by adding play equipment and opening up the space, the plan forced children and caretakers to access the two play areas in a below-grade, 20-ft.-wide "landscaped corridor" that its detractors derided as a "pit." Critics were worried the bad design created poor sight lines that would have severely limited caretakers' ability to keep an eye on children between the two playgrounds. If built, this plan would have prevented the recapture of thousands of additional sq. ft of desperately needed play space. For decades the sunken terrace had been used for active children's recreational space. Numerous playgroups and schools used the area as an extension of the pavilion. Children used play equipment installed in the terrace and a Department of Parks and Recreation worker was assigned to the playgrounds. Image Below (click on image to enlarge): Proposed Design - Michael Van Valkenburgh Associates/Union Square Partnership (BID) - (11/12/05) The large Concession Terrace (5) and additional building (11) would have taken away desperately needed playground space. Thankfully the poor design was defeated due to years of public pressure. 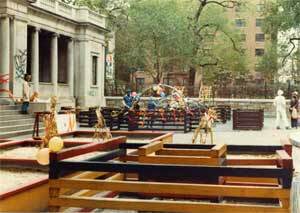 In 2004, Save Union Square Park, a grass roots, community - based campaign was organized by NYC Park Advocates to advocate for the needs of the community. With the help and support of 57 community organizations, elected officials and a broad-based labor coalition, the campaign succeeded in defeating this irresponsible plan while greatly increasing playground space, much of it recaptured from play areas lost to the previous seasonal cafe. 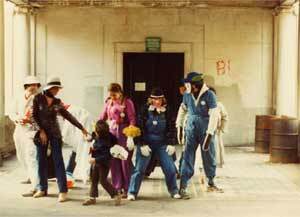 Today however, the BID and the City is still intent on seizing space from children and the public. They still plan to establish a seasonal restaurant in the park's historic pavilion including taking away 1800 sq. ft of newly created interior space for their kitchen. The restaurant would operate from May through October - when the public's need for and use of park space is the greatest. Despite vehement community opposition, the City continues to ignore the community's wishes. After years of failing to address the community's wishes, we were unfortunately forced to seek relief though the legal system. On April 19, 2008, the Union Square Community Coalition filed a lawsuit (USCC v. NYC Parks, Index No. 08/105578) challenging the Parks Department and Union Square Partnership's (BID) plans to install a restaurant in the historic pavilion. On April 22, 2008 New York State Supreme Court Justice E. H. Stackhouse issued a Temporary Restraining Order (TRO) against the City/BID halting the project in all respects except those necessary to make site safe for the public. On May 7, 2008 State Supreme Court Justice Jane S. Solomon allowed construction to procede on the renovation on the North End of the Park but extended the injunction which prevents the operation of a restaurant, or the installation of fixtures for a restaurant, pending further order of the Court. In so doing, the court found that USCC is likely to prevail on its central claim ­ that without state legislative approval, the restaurant would be an unlawful alienation of parkland ­ once that claim is ripe. The City has moved to dismiss the case, claiming it is both unripe (because, allegedly, several steps remain in the process before a restaurant concession could be offered) and non-meritorious. On December 8, 2008, Justice Solomon heard oral arguments. On March 30, 2009 Justice Solomon dismissed the lawsuit ruling, our suit was too early to file and was not ready (ripe) until they are further along with the restaurant. The main issue, whether or not the restaurant needs to go through the state legislation was not decided. If and when the city officially decides to issue an RFP (request for proposals) we can bring file another lawsuit. She also reaffirmed our position that not all restaurants in all parks are universally acceptable. We will be commenting more on this soon. For a more detailed look at the Union Sq. controversy and the four-year campaign please go to www.saveunionsquare.org. Return the pavilion to its original intent and former use as an indoor/outdoor sheltered recreation area for kids, playgroups, birthday and tea parties and story telling. 2. Year-round free access for people of all ages. Utilize the basement for yoga, exercise, ping pong, arts and crafts, senior programming, community events, sheltered quiet activities, free programs offered by non-profit groups and greenmarket nutrition classes, etc. 3. Free-speech rallies and demonstrations. Return the pavilion to its original use as a rostrum and staging platform for speakers at free-speech rallies and demonstrations in the North Plaza. Host movies, theater, summer concerts, dance, photography, art shows and workshops for children and older park users. 5. Exhibit space for permanent and temporary art exhibitions. 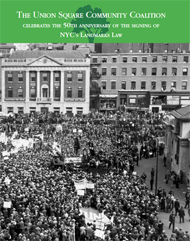 Create exhibits highlighting the important role Union Square has played in New York City’s rich history of public assembly, free speech, and social activism. Thanks to all who fought during the four-year period when we struggled to maximize the playground from the proposed 8,000 sq. ft. to its maximum of 15,000 sq. ft.
A New York State judge issued a preliminary injunction that prevents the City and Parks Department from moving forward with plans for a controversial high-priced restaurant in Union Square Park without State legislative approval. 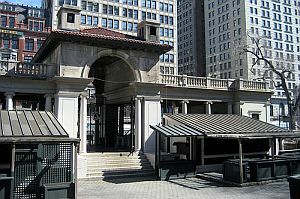 "Defendants are hereby restrained from altering the Union Square Park Pavilion to accommodate a restaurant and/or bar, from granting any further approvals to do so. and from actually operating a restaurant and/or bar in the Pavilion," New York State Supreme Court Justice Arthur F. Engoron wrote in his January 8, 2013 decision. In issuing his decision the judge ruled that the plaintiffs would likely prevail in its case because the proposed Pavilion bar and restaurant will not serve park purposes and therefore constitutes an illegal alienation of parkland. The suit was filed in May 18, 2012. "We hope this decision once and for all knocks out the Union Square Partnership/Bloomberg Administration's irresponsible plan to build a restaurant at the expense of the children and the community," said Geoffrey Croft, a plaintiff and board member of The Union Square Community Coaliltion which brought the suit. "We hope the City will accept this decision and not continue to force a non-profit to spend its resources to fight this careless plan. The historic Pavilion should be returned for the purposes for which it was built and now more than ever desperately needed." The strongly worded opinion granted plaintiffs' motion for a preliminary injunction and denied the City's motion to dismiss. The judge took into consideration the small size of the park and the high number of dining choices available in the area. "Here, plaintiffs have proved beyond a peradventure of a doubt that a restaurant is not necessary to insure that park participants do not go hungry or thirsty," Justice Engoron wrote. "On all the available evidence, plaintiffs' claim that defendants 'are attempting to create a high-end destination restaurant, as opposed to a public amenity that will serve ordinary park visitors,' rings true. The Pavilion restaurant's proposed prices would make broad swaths of the public think twice before entering." 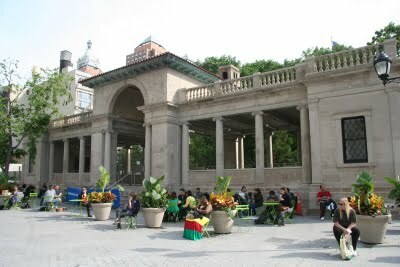 "All things considered, including the small size and large crowds of Union Square Park; the commercial character of the encircling neighborhood; the plethora of nearby restaurants of every description just beyond its perimeter; the prominence and importance of the Pavilion; the restricted views therein; and the operating hours and prices to be charged by the proposed restaurant, and based on the record at this stage of the litigation, this Court finds that plaintiffs likely will succeed in proving that the proposed restaurant would be 'in' the park, but not 'of' the park, would be a 'park restaurant' in name only, and would not serve a 'park purpose.'" BY SAM SPOKONY | In the latest chapter in a nearly decade-long battle against city officials and Union Square's business improvement district, community and park advocates last week hailed a judge's decision to block plans to create an upscale restaurant within Union Square Park. In his Jan. 8 decision, State Supreme Court Justice Arthur F. Engoron issued a temporary injunction that prevents the city Parks Department from moving forward with the construction. City lawyers responded by saying they will appeal that decision as soon as possible. Engoron's ruling was based on two main points: First, that the city never gained the state legislative approval that, under a public trust doctrine, is required for such a project; and his opinion that the restaurant would not provide any beneficial "park purpose." Activists and local elected officials had long argued that the proposed site for the restaurant - the pavilion at Union Square Park's north end - must remain open to public uses, such as playground space for children and various community functions. "It's shameful that the Bloomberg administration continues trying to take away desperately needed space from community members and their kids," said Geoffrey Croft, a representative of NYC Park Advocates and a board member of the Union Square Community Coalition, which filed the lawsuit last May. "The mayor thinks government shouldn't have to take care of parks, and that those spaces are better off just being used as cash cows for the city. This is a perfect example of that." Based on the facts of the matter, it seemed inevitable that the restaurant plans would come under fire for failing to take the neighborhood's current needs and atmosphere into account. As Engoron noted in his decision, there are only two playgrounds within all of Community Board 5 - which spans from 14th St. to the southern edge of Central Park, between Eighth and Lexington Aves. - while there are already more than 150 eating establishments within two blocks of Union Square Park. According to the city and its proposed restaurateur, Chef Driven Market, LLC, the pavilion restaurant would operate six months per year - from April to October - and would be open from 7 a.m. to midnight, seating around 200 people. The establishment would also be accompanied by a smaller food kiosk, which would be open year-round. Engoron also knocked the restaurant for its planned menu prices, which top out at around $34 for entrees, $15 for appetizers and desserts, and $18 for eggs at brunch. He agreed with community activists who claimed that the prices seemed more suited for wealthier dining crowds, writing in his decision that "the proposed prices would make broad swaths of the public think twice before entering." Assemblymember Richard Gottfried, whose district includes Union Square, notably joined as a plaintiff in the suit against the city, along with former City Councilmember Carol Greitzer and several other individuals. In an interview on Monday, Gottfried explained that while he rarely makes such a gesture, he felt a particular need to take a stronger stand in this case. "I think that for many years, and through many different mayors, the city has often looked on parkland as a sort of vacant lot that can be taken advantage of to make money," Gottfried said. "In this case, it would simply be wrong to take the pavilion away from public park use. And even if the restaurant proposal were acceptable, it ought to be done by law [with state legislative approval]." The assemblymember noted that, previously, he had in fact supported state legislative approval of a restaurant within Bryant Park, because it was seen as a way to revitalize what had been a largely derelict portion of the park. But in the case of perpetually bustling Union Square, he said that perspective simply doesn't apply. Gottfried also criticized the Union Square Partnership - the area's business improvement district, which is not a co-defendant in the restaurant suit - for continuing to push for the plan alongside city officials. "The BID has, at least on this issue, been too focused on one aspect of business needs, and over a period of time that's made it harder for them to work with elected officials and community groups," Gottfried said, adding that while this has been has been his only real disagreement with the BID, it has tended to "dominate the relationship" in recent years. Croft took more aggressive shots at the Union Square Partnership, calling it "outrageous" that the BID would attempt to - and potentially be allowed to - dictate land use in such a direct manner. Citing unnamed sources, Croft vehemently asserted that the BID had always been the biggest proponent of the restaurant proposal, and that the Parks Department only supported the project because of commands from the Mayor's Office. "I have a lot of sources in Parks," Croft said, "and people in that department hated this idea from day one, but they were under a lot of political pressure." He added that the department officials would have had to be "deaf, dumb and blind" not to understand that the needs of children and community members outweighed those of a restaurant owner and the city. The Union Square Partnership and the Parks Department declined to comment. But Hilary Meltzer, deputy chief of the city's Environmental Law Division, responded to all the criticism by claiming that Justice Engoron's decision to block the restaurant was simply off base. "The restaurant in Union Square is a proper park use, which we are confident does not constitute alienation of parkland," said Meltzer in a statement released after Engoron's ruling. "We believe the decision is incorrect, and we plan to appeal once the order is entered." Despite the criticism of Union Square area residents opposed to commercialization of the park, Community Board 5 voted in favor of the resolution to allow the restaurant planned for the Union Square Park Pavilion to have a liquor license. Despite this almost-unanimous vote, the board did note that they would have recommended denial of the resolution if certain conditions were not met. The list of 17 conditions primarily involved potential noise issues and including prohibiting dancing at all times, prohibiting live music or DJs and only allowing record music in the interior space, discouraging customers from loitering outside, prohibiting the use of a velvet rope to prevent lines outside the Pavilion and engaging a sound engineer to make sure that sound does not emanate to the surrounding area. Although the conditions from CB5 were agreed upon by the prospective restaurant owner, Simon Oren of Chef Driven Market LLC, and the resolution was passed, the liquor license still has to be approved by the State Liquor Authority. Manhattan Borough President Scott Stringer and Assemblyman Richard Gottfried prsented a joint letter in opposition to the proposal, primarily because of the proximiny of consumption of alcohol to a children's playground. Taylor noted that the Union Square Community Coalition is also concerned about this issue, which they believe was not adequately addressed by the community board's conditions. "While we appreciate the community board's attention to detail, we are disappointed that there is no reference to the State Liquor Authority's 500-foot rule," he said, referring to the law that discourages more than three liquor licenses within a 500-foot radius unless it is in the public interest. "Given that there are more than 20 existing liquor-dispensing establihsments within 500 feet of the Pavilion, the public interest wouldn't be served with the addition of another, especially one within close proximity to a children's playground." Regardless of whether or not the restaurant will serve liquor, however, the Union Square Community Coalition is still planning to file litigation against the restaurant because of the privatization of the Pavilion. Below are statements some of our members and supporters delivered in whole or in part while opposing the license at the two Community Board 5 hearings: Please click on the following hypertext titles to see each statement. 1) The USCC Attorneys' Comments; 2) General Talking Points; 3) USCC Board Member Jack Taylor's Statement; 4) USCC Board Member Edith Shanker's Statement; and 5) Former NYC Council Member Carol Grietzer's Statement. 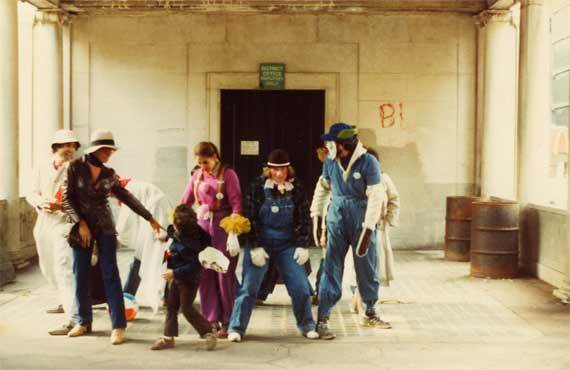 up the space, the plan forced children and caretakers to access the two play areas in a below-grade, 20-ft.-wide "landscaped corridor" that its detractors derided as a "pit." Critics were worried the bad design created poor sight lines that would have severely limited caretakers' ability to keep an eye on children between the two playgrounds.